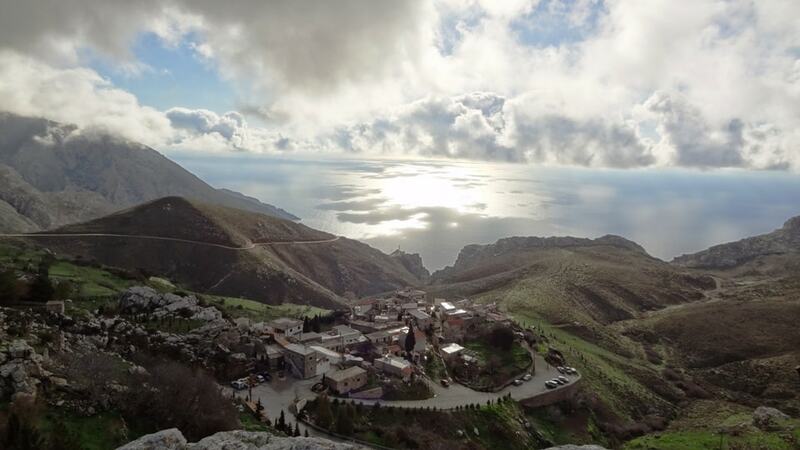 Kapetaniana, a small settlement in the heart of the Asterousia mountains is one of the most impressive and beautiful traditional villages of Crete. The view of the Lybean sea, the imposing peak of Kofina, the small stone houses and the full of stones and rocks create a unique scenery. To this wild and inhospitable landscape far away from civilization owes its existence. For thousands of years the place was an ideal hiding place for rebels fugitives and for those who wanted to be isolated from the rest of the world. Here came the Eteokrites, the genuine first inhabitants of Crete after the invasion of Dorian tribes. In Christian times was founded the Vathmou monastery, which later gave its place to "Panagia Kirie Eleison" and later turned into a village. After years of abandonment, the Captain-rebels of the village Asfendou of Sfakion found shelter here. After the revolution of Daskalogiannis τthey fled to Kapetaniana continuing their revolutionary action against the Turks.The name of the village derives from these captains. Until recently, the access to Kapetaniana was very difficult as there was no asphalt road. A few kilometers after Kapetaniana at Lousoudi area just below the Kofinassummit we will see the small church of the three Hierarchs. The small chapel with the ruined courtyard doesn't reveal anything from the glorious history of the monastery that was here. According to the archaeologist Athanasios Paliouras, the first "Hellenic University" was founded in the 14th century by the monk Iosif Filagris, a scholar of Aristotle.The persecution of Aristotle by the church and the ban on the teaching of the Greek language by the Venetians led the monk to this isolated and inhospitable part of Crete with a great tradition of monasticism and asceticism. Together with his students he copied manuscripts, codes and parchments of ancient writers, mainly of Aristotle, contributing to their rescue. 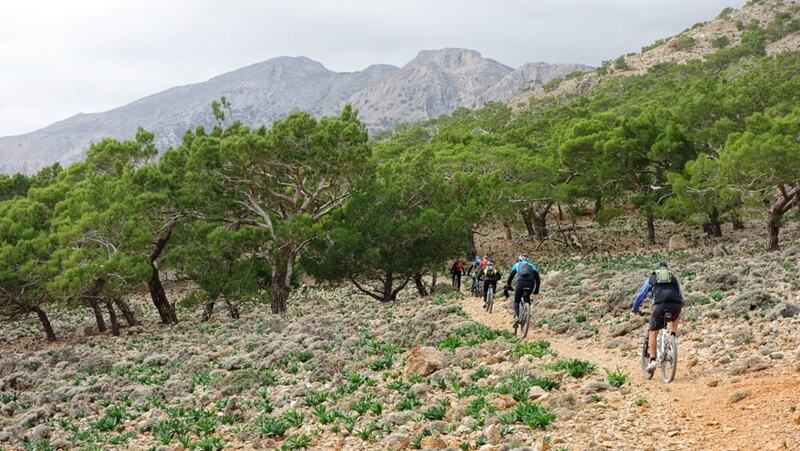 After some steep hills that are spoilet in winter from the rains we reach the base of Kofinas the highest and most imposing summit of Asterousia mountains. 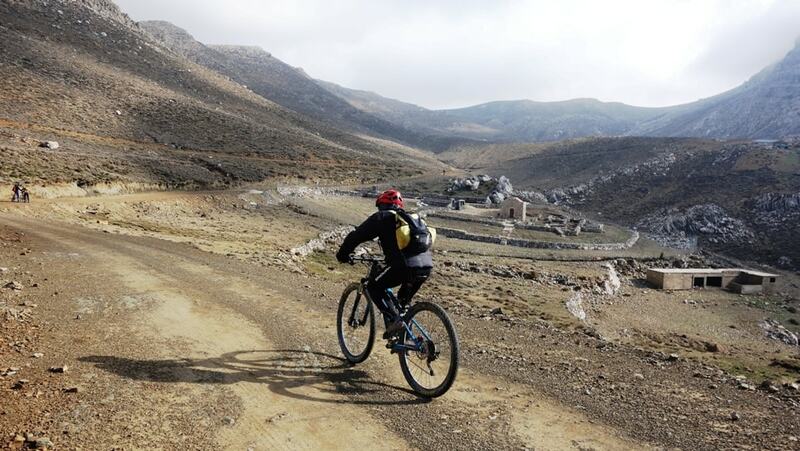 If you want to go to the top of the holy mountain of Asterousia you have to lock your bikes and climb the steep path. In the chapel of the Holy Cross, that is celebrated on September 14 revives a custom residue of Minoan tree-nature worship. On the eve of the feast the locals cut the apples, as they call them, from the three apple trees on the north side of the mountain. The next day they place the basket on the altar, the priest bless them they do a litany and offer them to the pilgrims instead of holy bread. These fruits are chickpeas-sized and the tree is not an aplle but krategos or kedoumalia, as they call them in Crete a plant that is very strong to drought. 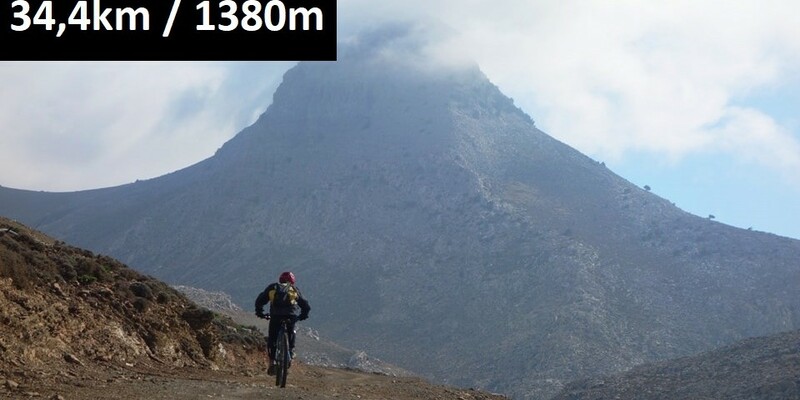 At Kofina we have climb the highest point of the route. 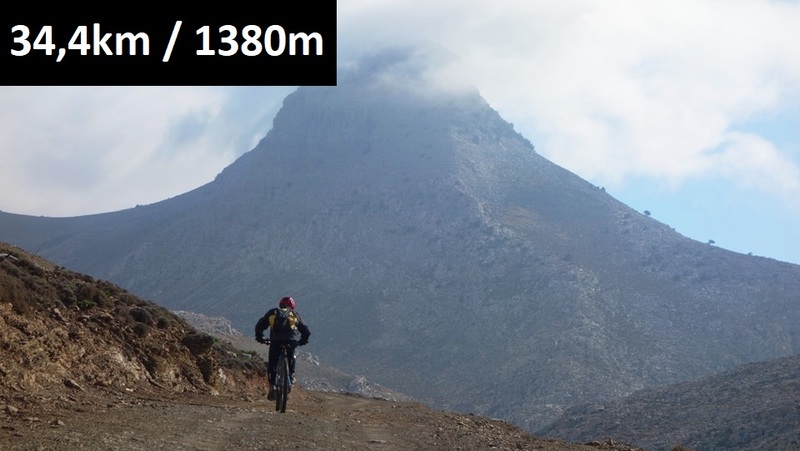 After a short descent and then a small ascent, we will climb at 1050 meters above sea level. 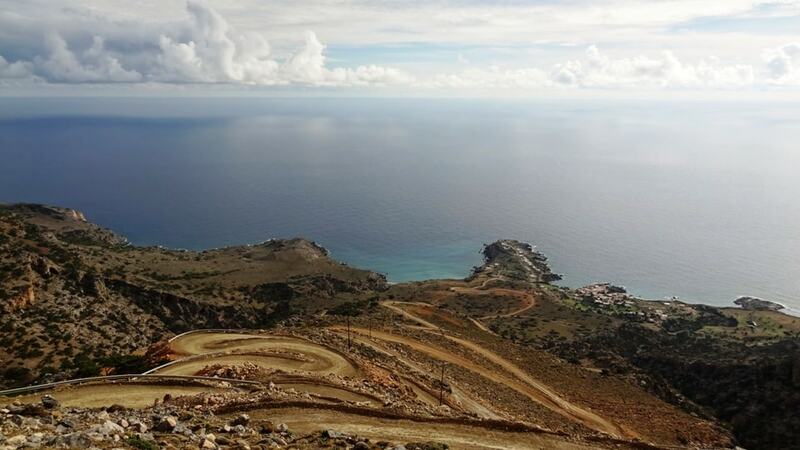 From here starts one of the biggest and most spectacular downhills in Crete, without any uphill, on a wide dirt road with a breathtaking view and finish at the sea. 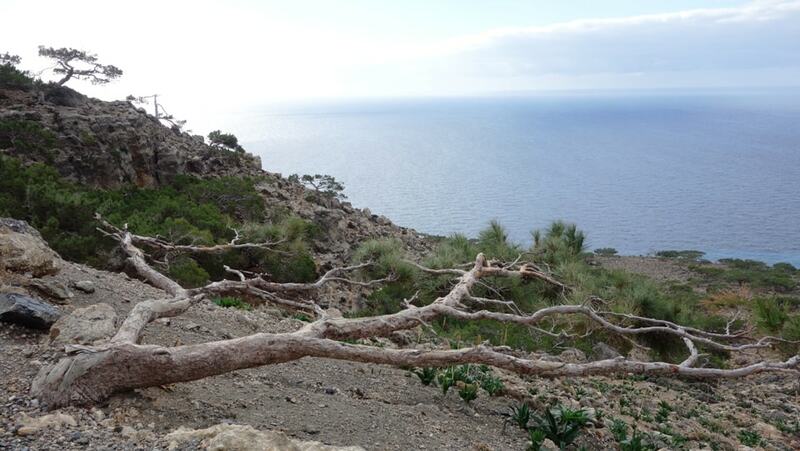 The view of the endless blue of the Libyan Sea, the steep cliffs, the green pine forest and the naked Asterousia are unique. 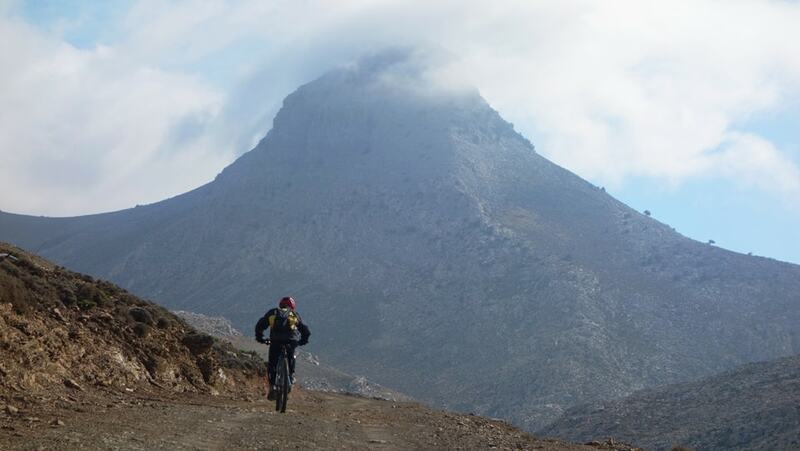 We have to do some stops not only to admire the splendor of southern Crete but also to rest our hands and brakes. 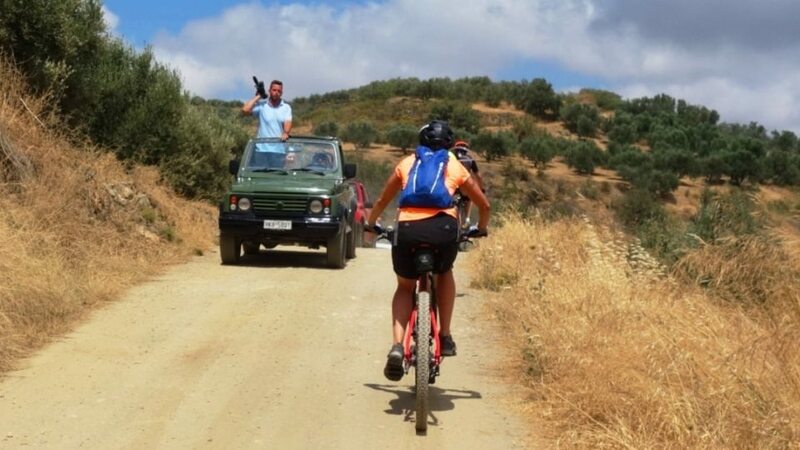 After 12 kilometers of endless downhill, we reach the Monastery of Koudoumas, a small oasis in the wild landscape of the Asterousia west of Cape Martelos. In 1878, the monks Parthenios and Eumenios, from Odigitria monastery, began to rebuild on the ruins of the older church "Monastery of Christos", which had been abandoned. Today, besides the cave-church of Panagia, there is also a church devoted to the founders of the monastery. The monastery is very hospitable and there is always food, coffee or room to offer to the pilgrims and visitors. The celebration is on the fifteenth of August and there is a great feast. Many believers do vow and walk to cross over the mountain and come to church. If you want to stay overnight in Koudouma this time of the year it is better to take your sleeping bag and sleep on the beach. Apart from swimming in the crystal clear sea you will have the opportunity to observe the starry sky, here without any artificial lights it is particularly impressive. 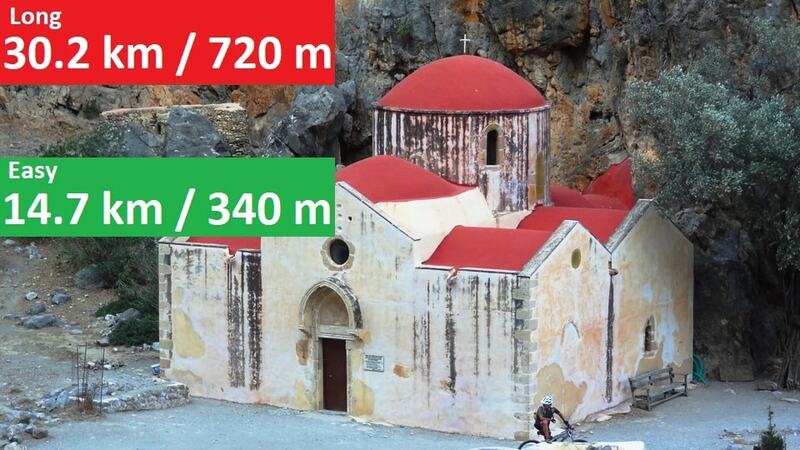 After Koudoumas we will follow the path to pass to Agios Ioannis. In the beginning as in some other places we have to carry the bikes but most of the path is rideable. 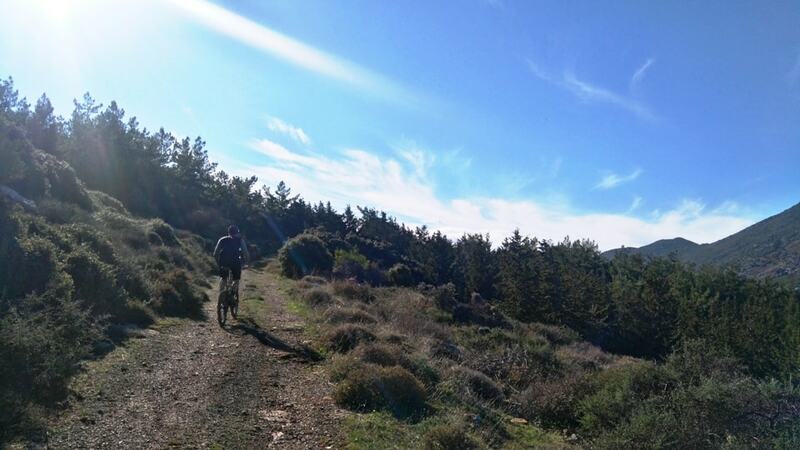 The green pine forest of Koudoumas contrasts with the African landscape of the southernmost mountain range in Europe. The microclimate south of Kofina has created a small paradise that does not look like the rest of the Asterousia landscape. Throughout the path there are signs and it is difficult to miss it. You should definitely take a small detour and walk to the impressive cave of saint Anthonios. 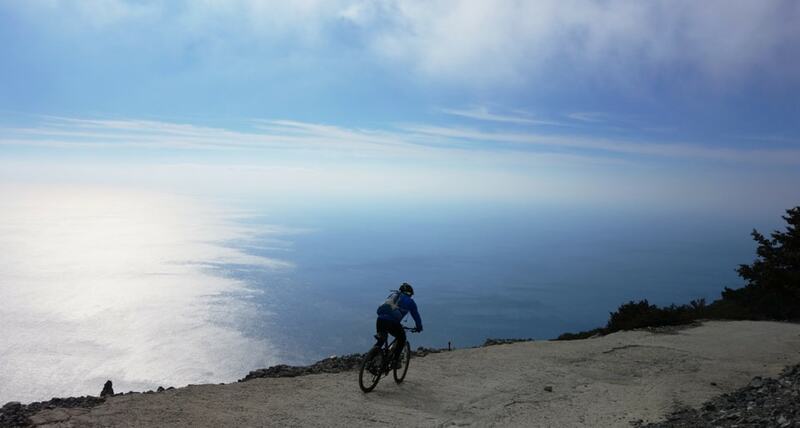 In the Agios Ioannis seaside settlement (harbor of Kapetanian) you can make a stop for coffee or water before you start the hard ascent of the return. 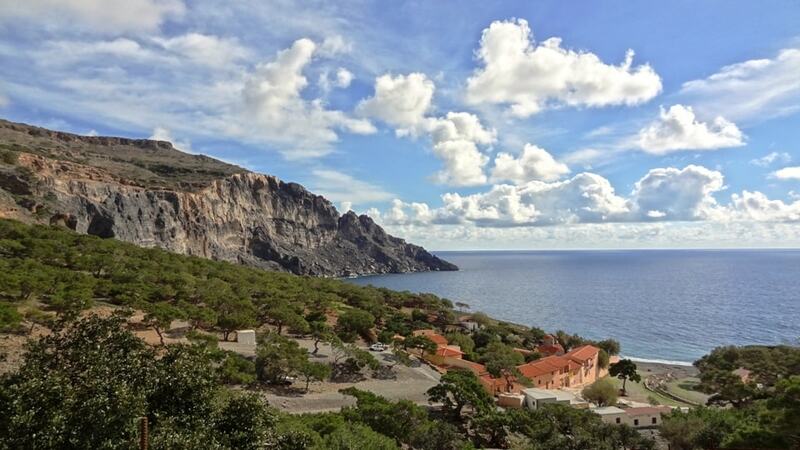 Here there are cafes and restaurants next to the sea but it worth visiting the abandoned monastery of saint John 1km west of the village. On the exterior wall of the church are depicted the doctor saints, Cosmas and Damian, as also Saint Panteleimon the patron of doctors. This is connected with the fact that the place in ancient times was used as Asklipio (hospital and worship place of Asklipios )which maintains its religious tradition and later when the Christian religion arrived. 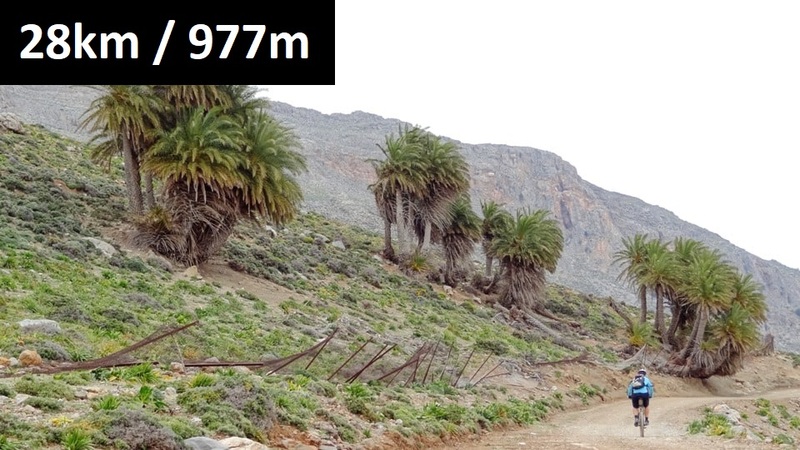 The climb up to Kapetaniana is long and painful, cycle slowly and make some stops to rest. Admire the view and the canyons of Goulas and Elygias West and East. After the antennas the road is wider, faster and with better slopes. When strong winds blow in the area, as they come down from the cliffs of Kofina, they accelerate and gain more power making cycling dangerous at some turns and the ascent painfull. Even the trees at some place, to survive the fury of wind, grow not vertically but parallel to the ground.